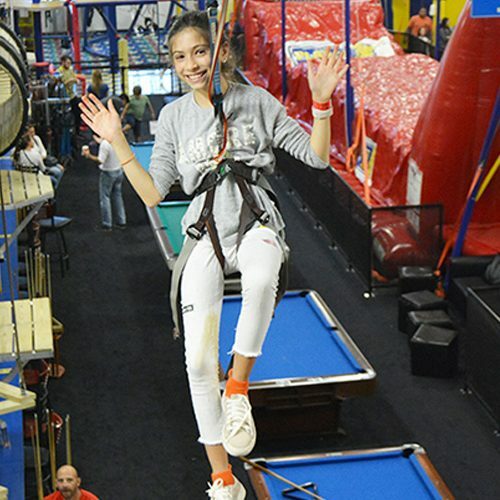 Our 16,000+ square foot Indoor Trampoline Park brings PLAY to a whole new level. 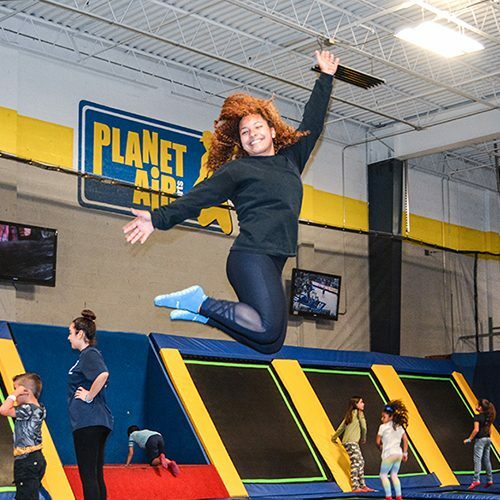 Come visit Planet Air Sports and enjoy having "Out-of-this-World" fun jumping to your hearts’ content on our Indoor Trampoline Park. 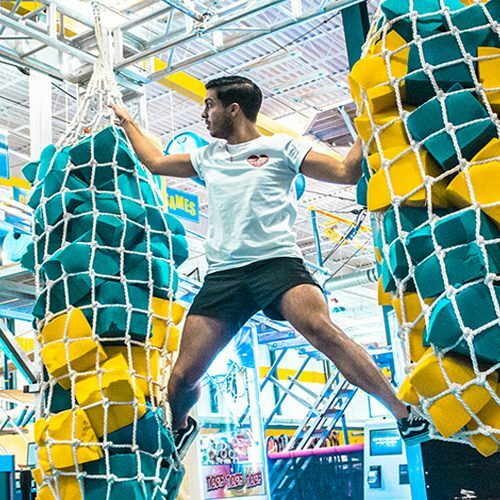 It's a Non-Stop Fun attraction for all ages and it's also a fantastic workout you won't want to miss. 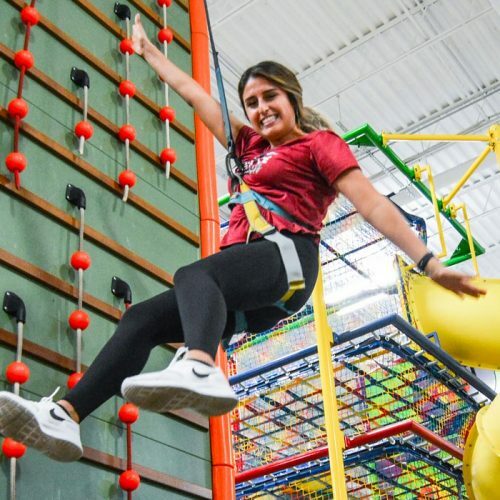 While on the trampoline park, choose between our different available attractions or try them all out. You can take your best shot at our (3) three different height Basketball Hoops. 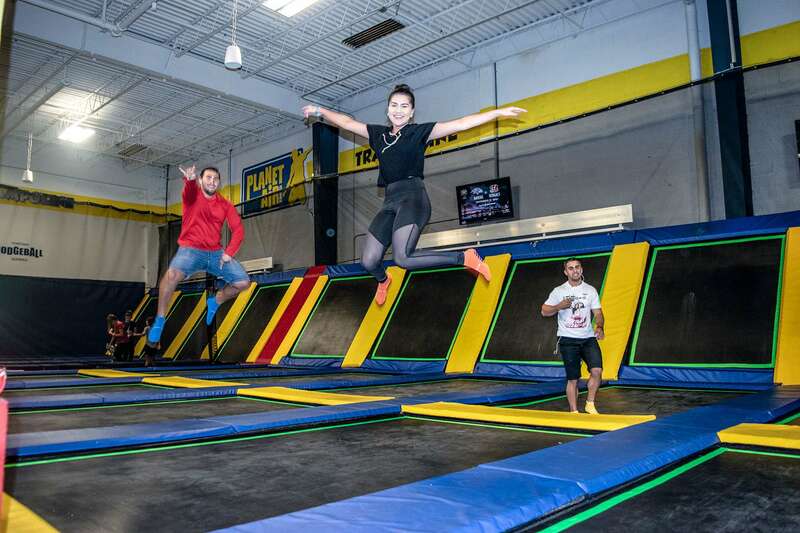 You can come join us for a challenging and adrenaline filled game of Dodgeball on our state of the art Dodgeball trampoline, or you can simply jump for fun and flip to showcase and practice your skills amongst your family, coworkers and friends. Our NEW Bowling Alley will bring up the FUN to a whole new level. Ever have those nights where you are at home bored, and then you get this brilliant idea to go bowling, but you do not just want to bowl, you want to do other things as well? 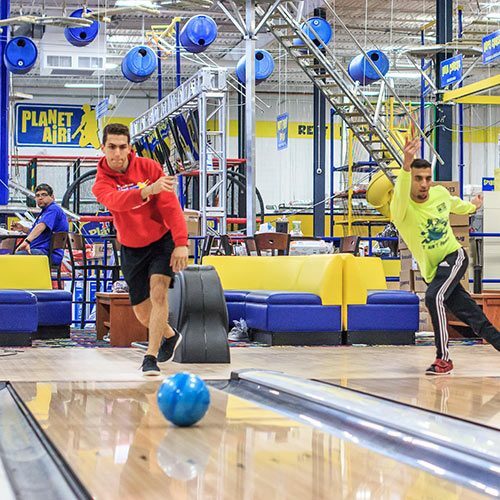 Well, at Planet Air Sports Doral we have it all, including the bowling alley. Our bowling alley is kids friendly, too. While you are playing, you can have some of our delicious food and drinks that are available at the Planet Air Cafe. For the adults we also have beer and wine. No need to check for snow conditions, our Ski Slope is open year round! Living in Florida is probably one of the best things ever. The only thing missing is mountains to go skiing or snowboarding. Too bad we cannot bring them here, right? Oh wait, we did! Now, indoor skiing and snowboarding is available all year round at Planet Air Sports in Miami, Florida. We have a ski slope (ski simulator) that you can snowboard and ski. Whether you are a beginner, or a seasoned pro, our unique indoor ski slope provides you with the same disciplines as on-hill riding, but within a controlled and safe environment. If going upside down is thrilling for you, wait until you try our 360 degree rides. We have 3 different 360 degree rides. The first one is called the X-Board. After swinging back and forth, you can make it go around 360 degrees. Next, we have the X-Bike. 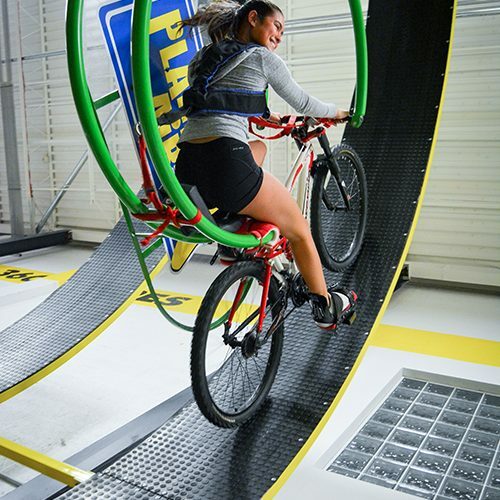 On this fun ride, you must pedal on a bike that is inside a huge circular structure to make it go around 360 degrees. Then comes the most challenging one of all, by far the wildest ride we have ever had: The Spin Board. Not only does this ride go upside down, but it goes in all directions, every which way imaginable. It is one experience you will not want to miss. Our new state of the art ropes course reaches new heights. After our employees strap you in, and make sure you are completely safe, you will experience all types of obstacles. We have two exciting and challenging ropes courses. 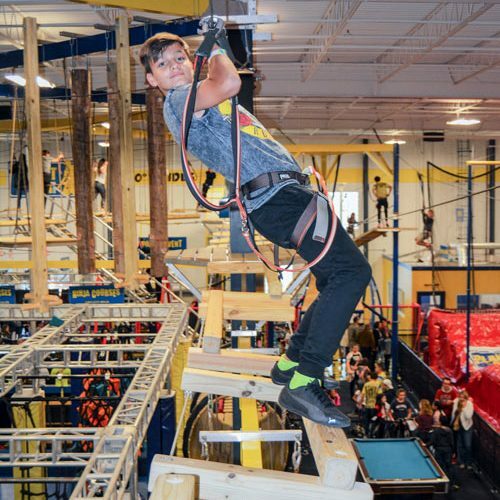 You will be balancing through ropes, going through barrels, walking on planks, cubes, moving bridges, riding a skateboard attached to a wire, and you will also be going over tires that are suspended in the air! Ninjas of all ages are welcome to test their skills in our challenging Ninja Course. Ever watch the American Ninja Warrior show and say: I can do that! Well now you can, at our Doral facility we have a whole ninja course just for you. Put your skills to the test on our new Ninja Course. Ninjas of all sizes are welcome to test their agility, strength, speed and coordination while maneuvering through different obstacles. This means you can jump from challenging elements and be the warrior you always wanted to be. This course will sure test your strength, agility, patience and your drive. Think you can complete it? Come to Planet Air Sports ready to reach for the top. 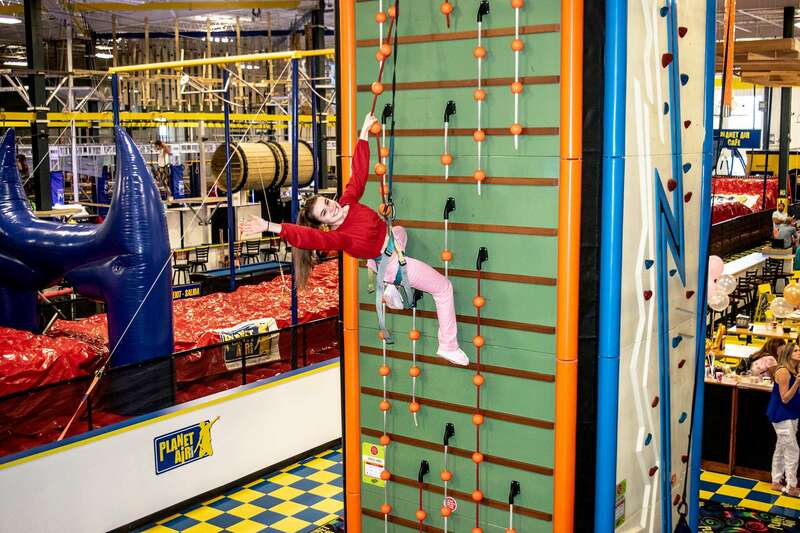 We have eight rock climbing walls in different levels.One of our rock climbing walls is called the Twister and it has two levels of difficulty. It’s fun; it’s tall and it’s very colorful! Our new edition is the Ninja Wall where you will feel just like Spiderman going up a 24 foot tower. For a different type of adrenaline and competition you can climb out transparent wall. For the little ones, we offer our Toddler playground. 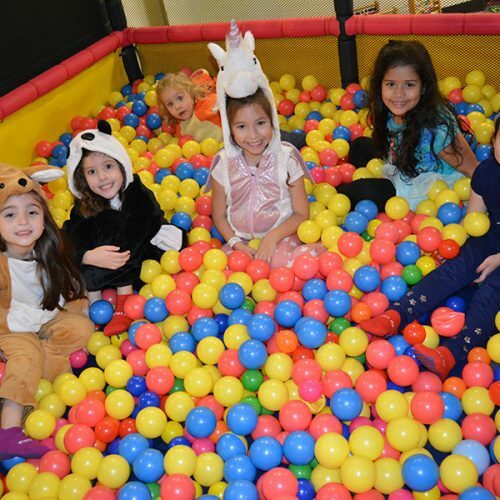 They can spend hours playing on our mini trampoline, kid’s climbing walls, slides, games, books, puzzles and much more! Cost is $15 per child. We have a wonderful two level soft play playground. Not only is this playground tons of fun, but it’s good for them as well! The exercise coming from the attractions will have your kids feeling great! There will be an employee present at the playground watching over the kids, making sure they are safe. We have also added a seating area placed around the playground so you can watch your child while eating. Our zip lines tower over 20 feet high and 100 feet long. Everyone loves ziplining, and now you never have to stop! As you zip line across the length of the park, you will see wonders along the way. The great thing is that it doesn’t stop there, you get to zip line there, and then back again. This being because our zip lines are recurrent. The fun just doesn’t end! No more waiting in line to zip line. You chose when enough is enough for you. You can even race your friend as you both zip line across from each other. These zip lines are all fun and we cannot wait for you all to try them. Jump, Jump, Jump in a Triple Bungee Trampoline. You can jump off of 3 trampolines that are in a V-shape, all at the same time. 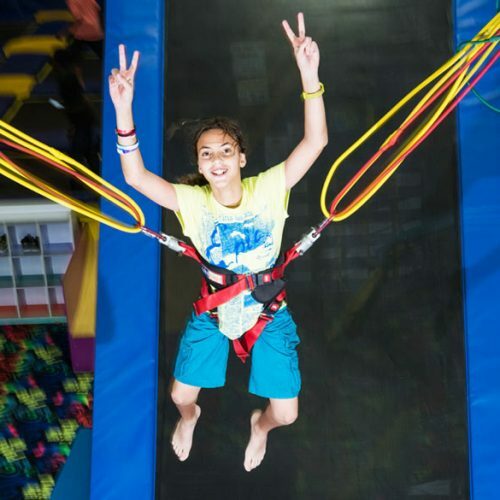 As the bungee cords stretch, you will soon be demonstrating your acrobatic talents by doing somersaults, flips, twists and spins, and then landing safely on your feet! A game of endurance, vision, strength and agility. 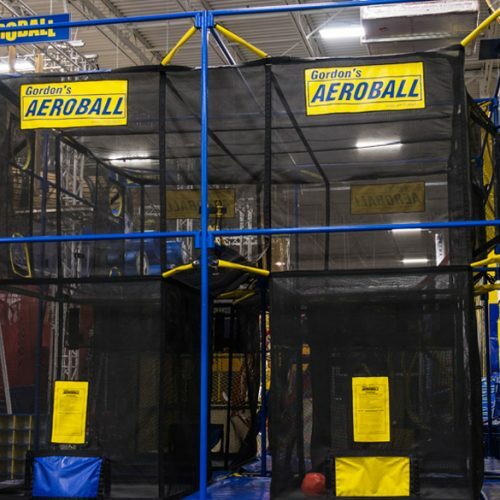 Aeroball and Jumpshot will tire out world class athletes in a matter of minutes and provide cross-training for any aerial or cardio related sport. The essence of the game is reading the other player's movements and adjusting your shot and jump accordingly, while trying to get the double bounce factor. That is achieved by jumping a split second after the other player. This gives you an extra lift while stealing it from your opponent. The same as Aeroball and Jumpshot, but more intense! 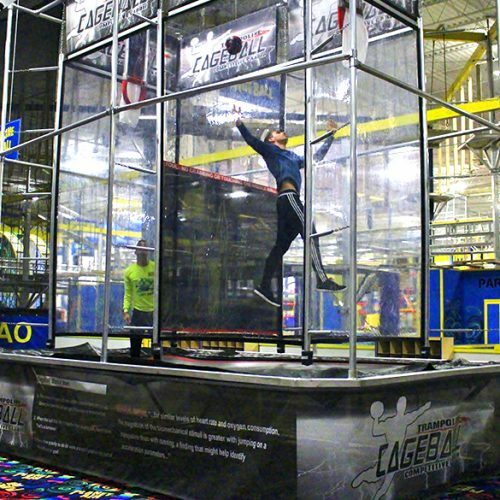 Trampoline Cageball will tire out world class athletes in a matter of minutes and provide cross-training for any aerial or cardio related sport. The essence of the game is reading the other player's movements and adjusting your shot and jump accordingly, while trying to get the double bounce factor. That is achieved by jumping a split second after the other player. This gives you an extra lift while stealing it from your opponent. 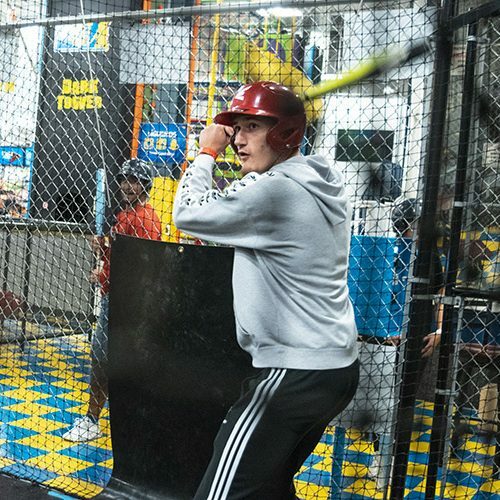 At Planet Air Sports you can feel like a professional baseball player that is practicing batting. Ever have plans cancelled because of the weather? The heat, rain or wind will not stop you from playing your favorite sport. We have a machine shooting baseballs or softballs which can deliver any pitch that a human pitcher can. Batters can choose the speed and the height of the baseballs or the softballs. Ever watched Gymnasts at work and wanted to soar through the air like they do? Well, we are giving you the opportunity to do just that. 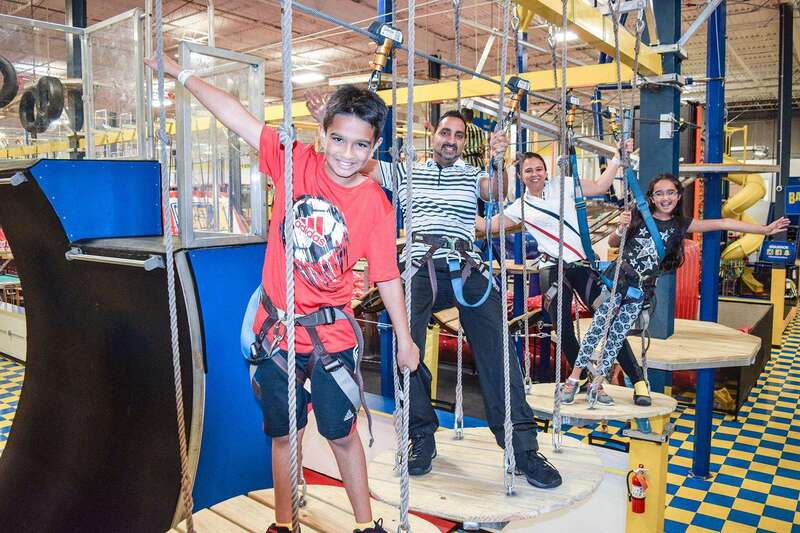 Planet Air Sports would like to introduce you to our monkey bars and trapeze attractions. At the Trapeze, take hold of your fears as you stand over 20 feet above the ground, swinging from one bar to the other. Below you, there is a state of the art air bag to break your fall. 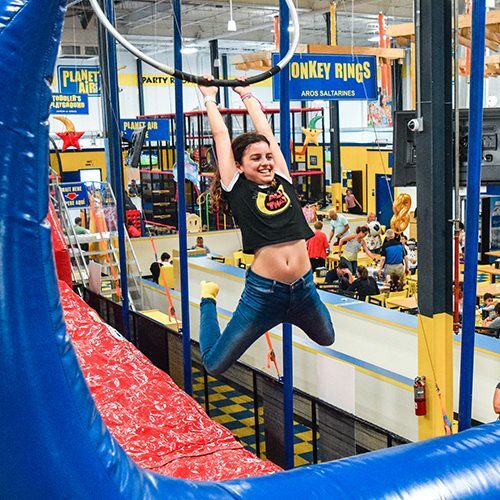 Our Monkey Rings are for those a little more scared of heights because they are closer to the air bag than the trapeze, but no shortage of the thrill. Make no mistake, this is no easy challenge as it will require a lot of strength and grit to make it to the end. We have all you need to experience your adventurous side! You have everything from retro classics, arcade fan favorites, shooting games, ride simulators and a variety of redemption machines. Win e-tickets and choose your favorite prizes at our incredible redemption center. 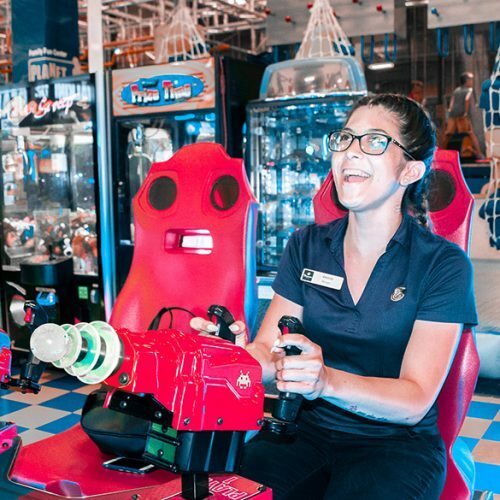 Bring your family, meet your friends, and have fun in our interactive arcade to experience some of the coolest and most advanced games around. - Participants' maximum weight is 250 lbs. - Lower ropes course, 45” min. height. - Upper ropes course, 56” min. height. - Recurrent Zip Lines, minimum height of 56”. - Participants must safely fit in harness. - No hanging or horseplay. Operator reserves the right to expel participants from the attraction if exhibiting the wrong behavior. - Attractions are not recommended for guests with the following conditions: Pregnancy, Neck problems, Back Problems, Heart Problems, Recent Surgery or any history of physical condition that may be aggravated by this attraction.